Review: Riley Liston stars as the major character in the novel Sports Camp by Rich Wallace. Wallace based some of this story after his experiences as an eleven year old at sports camp, such as the famous, legendary turtle, Big Joe. And, the story also takes place in New Jersey, Wallace’s hometown. Riley Liston just turned eleven in April and is not the biggest kid in the pack. He is going away to a sports camp for two weeks haunted by Maynard, a victim to Big Joe, a legendary snapping turtle. Riley knows he is not the best athlete in most sports but when it comes to swimming, he could just pull it off. When he goes to camp, Riley and his bunkmates are determined to win the Big Joe trophy. But what will these kids do to win it? When they are pranked with gross substances, ordered to eat revolting food, and totally beaten in most sports, will Riley and the rest of cabin three be in it to win it or to lose it? Sports Camp is astounding. It was a good story, and I liked that the author based some of the story after his own life. The only thing that disappointed me was that it was a short book. I wish he could have written a bit more since he has an amazing talent to write. I like that at the end of every chapter there is a bulletin or newspaper telling the reader what is going on – like all of the upcoming events and winners of challenges. Also, I like how there are some devious and sneaky pranks going on like “slime” on the walls of cabin three and the egging of cabin four. I think this book is good for almost all ages. It is a cool story about a weak, small kid bringing his team to the top with all of these distractions going on throughout camp. I really enjoyed this book and so will many other readers when they read the first page. Review written by Sheila (7th grade student). We would like to thank Random House for providing a copy of Sports Camp for this review. 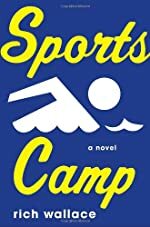 Have you read Sports Camp? How would you rate it?